Welcome to the Troop 11 New Rochelle Website! 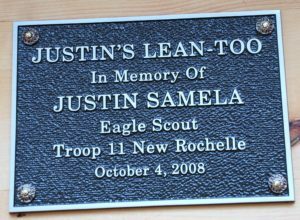 Our site is dedicated to the memory of Justin Samela – member of the Troop 11 family, Eagle Scout and friend. Justin left us on August 7th, 2007, but will never be forgotten. Congratulations to Mike Ruggerio, Troop 11’s newest Eagle Scout! Copyright © 2019 BSA Troop 11 New Rochelle | Donated by GSpeedCS LLC.